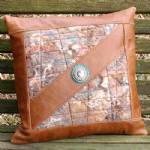 The front of this one-of-a-kind pillow features triangles of my handmade felt. The felt is made of brown corriedale and white merino wool with accents of coral, green, and blue acrylic fibers and white silk fibers. The center of the pillow features a silver- and gold-tone metal concho backed with a turquoise leather rosette. The diagonal stripe and border on the front and the entire back of the pillow are a soft garment leather in a distressed brown finish. The closure is a heavyweight brass zipper. The commercial pillow insert (included) contains polyester fiberfill and is a generous 14 by 14 inches.